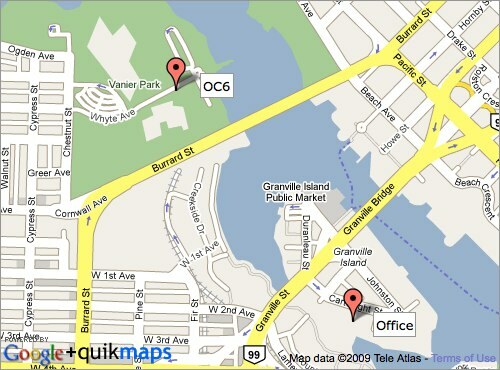 FCRCC is located on Granville Island in Vancouver, with an office in the False Creek Community Centre (FCCC), and in the Burrard Civice Marina on-land compound at the mouth of False Creek. Alder Bay and the False Creek Community Centre on Granville Island is home port for our Dragon Boat fleet and programs, most of our solo outrigger (OC1) fleet and courses, and our flatwater (Kayak, Canoe, SurfSki) fleet and programs. There, we are able to take advantage of the change rooms, showers, sauna and fitness facility in the FCCC. A small amount of storage for members’ small boats is there too. The club office is in the FCCC. The Burrard Civic Marina, where we keep our fleet of multi-person outriggers (OC2, OC4 and OC6), is home port for all the outrigger programs. There is also a large amount of storage for members’ small boats. Granville Island offers free 3 hour parking, once per day. Note that they do not allow for in-and-out privileges; that is, if you park on the island in the morning, leave, and then return to another free parking spot on the island later in the day, you may still receive a parking ticket even if the total time parked is under 3 hours. Pay parking is available if your stay exceeds 3 hours. 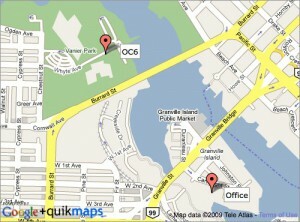 More information can be found on Granville Island’s website.